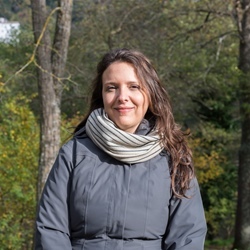 Luciana Squadrilli introduces nine of the most traditional and delicious winter soup dishes found throughout Italy, including the classic minestrone and some more unusual regional delicacies. Italy may be most famous for its delicious carb-filled superstars pasta and pizza, not to mention the many sweet treats that vary from one region to another. Yet the different regional traditions also feature plenty of delicious soups, often served as primo piatto – the course between a starter and main. 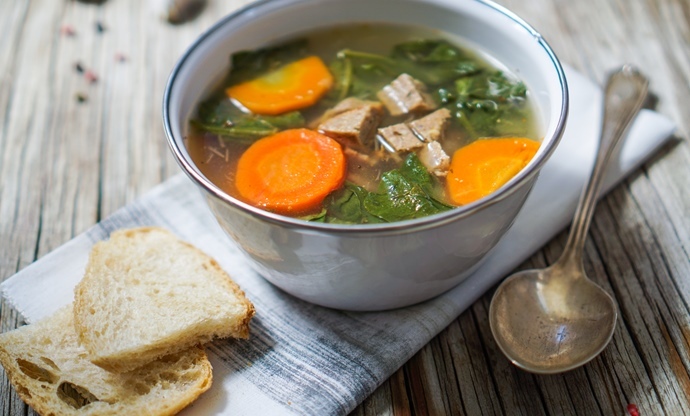 Usually earthy and filling, Italian soups are mainly based on vegetables and beans – occasionally matched by cereals or bread – but sometimes include meat, cheese or fish. While fish soups – such as the brodetto from Marche and Abruzzo – are obviously popular on the coast (particularly in summer), the rest of them tend to be enjoyed in the colder months and their ingredients are strictly related to the season. Here are nine of the most popular and traditional Italian winter soups, from north to south. Clearly showing its Austro-Hungarian origins, barley soup or Gerstensuppe is a staple of South Tyrolean cuisine. When visiting the idyllic mountain region in northern Italy, you’ll find it almost everywhere – from cosy mountain huts to elegant hotel restaurants. 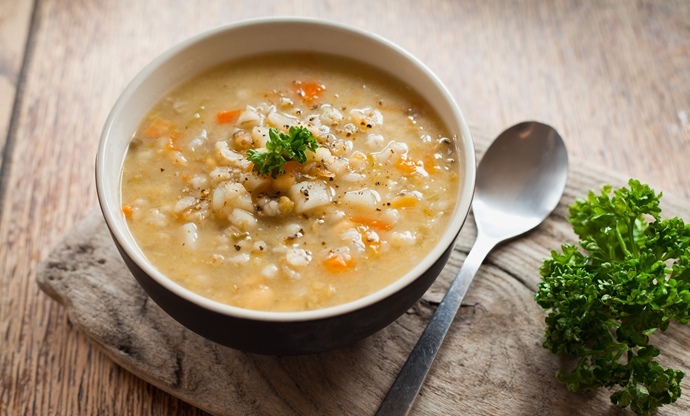 The rich soup is made with pearl barley cooked in meat stock and a mirepoix of carrots, onions and celery, before being enriched with potatoes, smoked bacon or local speck (smoked ham) and chives. Barley soup is often served with tirtlan, savoury fritters filled with spinach and ricotta cheese. Minestrone is the ubiquitous Italian soup, made up of different kinds of seasonal chopped vegetables often paired with potatoes, beans and mushrooms. They’re always lightly cooked so they retain a little bite, which helps make the broth more substantial. A healthy and light recipe, minestrone is often bolstered with tasty ingredients such as a very good extra virgin olive oil, plenty of grated Parmesan (or the cheese’s crust which will gently melt, adding flavour to the whole pot), some spices, rice or small shaped pasta. In Liguria, they add one or two tablespoons of pesto, the famous local basil sauce which lends a fresh, rich finish. Savoy cabbage (or the similar white cabbage) is a tasty winter vegetable that’s quite popular across Italy and much appreciated for its nutritional value. In Veneto it is a main ingredient of the region’s traditional cuisine, featuring in the tasty risi e verze (a mix of rice and cabbage not unlike risotto) and other recipes. In this case, cabbage is sliced and boiled with onion, carrot, celery and diced potatoes until everything is soft and almost creamy. It can be a vegan recipe, yet the local tradition suggests adding some crumbled sautéed sausage or smoked bacon. One of the Tuscan food classics, ribollita is one of the smartest examples of the so-called cucina di recupero (food recovery recipes). Created to make the most of stale bread and whatever was growing in the garden, today this rich soup is a cherished winter comfort food. 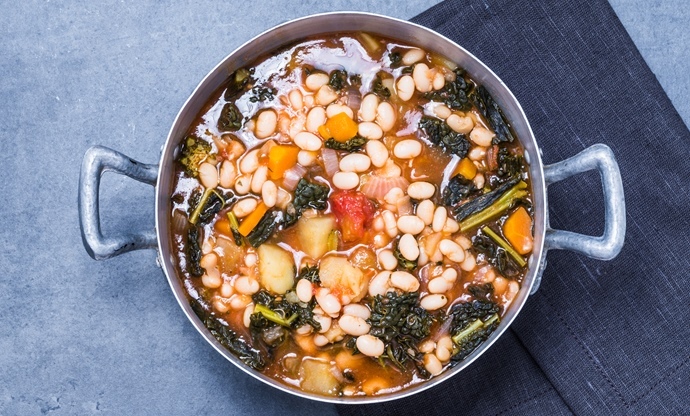 Essentially made of beans and seasonal greens – amongst which Italian kale (lacinato) or cavolo nero is fundamental – it takes its name (literally meaning ‘boiled twice’) from the fact that it’s cooked two times. 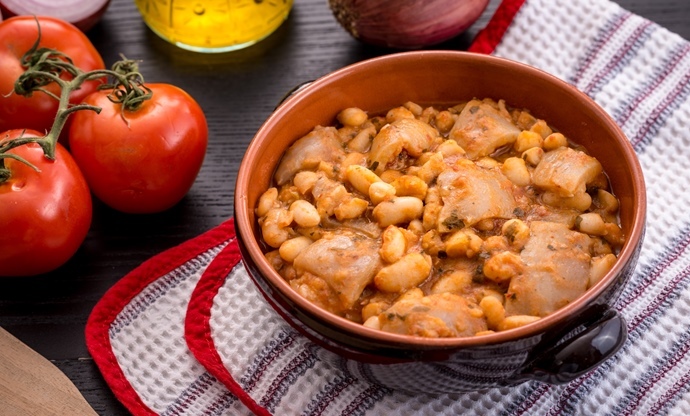 Vegetables and beans are first boiled and left to rest overnight, then some loaves of stale, classic unsalted Tuscan bread (pane sciocco) are added before cooking it again in a pot or in the oven, ready to be served. Recipes can change from family to family, and many choose to include a gravy, tomato paste or fresh herbs. The result is a creamy and delicious soup. 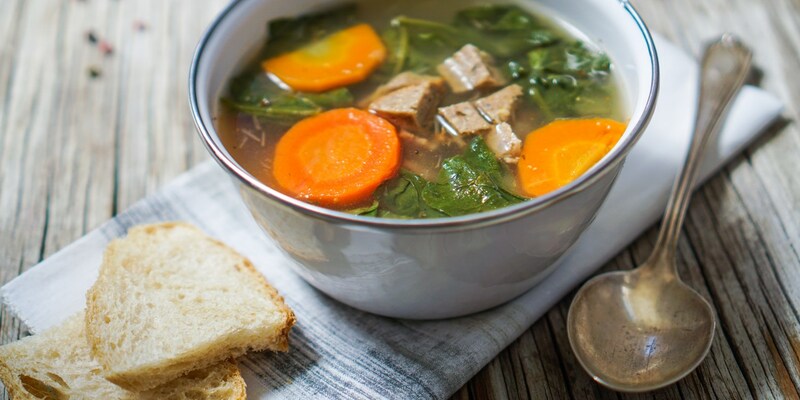 Born as a humble recipe to add more taste and substance to beans using a part of the pig that’s usually wasted (the rind), this popular soup is very flavoursome. Rinds are cut into strips and boiled until soft, then added to a pan (or even better, a clay pot) where garlic, onion and herbs are cooked with olive oil or lard. Tomatoes and beans (previously soaked in water and boiled) are then added, cooking together until everything is soft and a tasty, loose sauce is formed. A rich yet clear stock made with chicken (or, even better, capon) – zuppa imperiale contains small square baked dumplings made of eggs, Parmesan, semolina and butter, sometimes flavoured with nutmeg and black pepper. 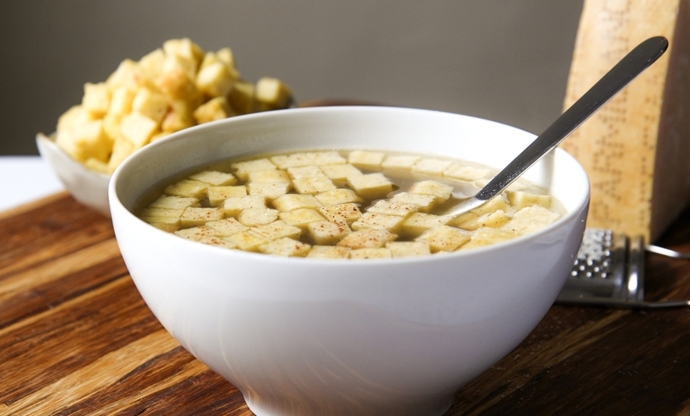 The cubes are then quickly cooked again in the broth and served hot, as a warming and nourishing soup perfect for winter celebrations. In Emilia-Romagna and Marche – where it’s also known as pasta reale – it can replace tortellini in brodo on the Christmas menu. 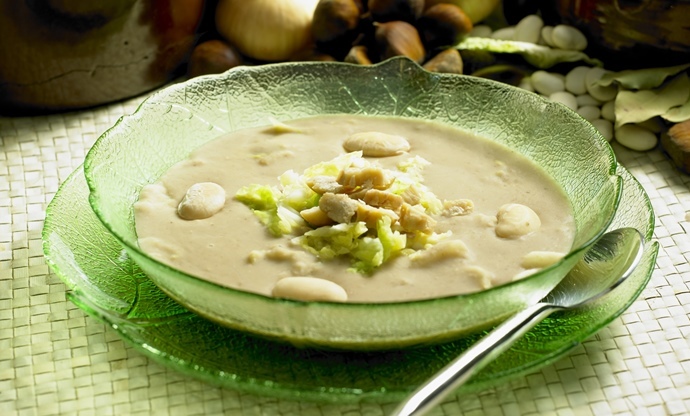 A classic of the traditional mountain cooking of central Italy – from the Apennines in Abruzzo and Molise to Sardinia – this rich soup puts together borlotti beans (or sometimes chickpeas) and chestnuts; two ingredients which once formed the basis of the local diet, when meat was an unattainable luxury for the average Italian. Separately boiled (possibly adding some bay leaves to the chestnuts), the two main ingredients are then cooked together in a clay pot with onion, olive oil or lard and herbs. Other possible additions include potatoes, bacon or mushrooms. 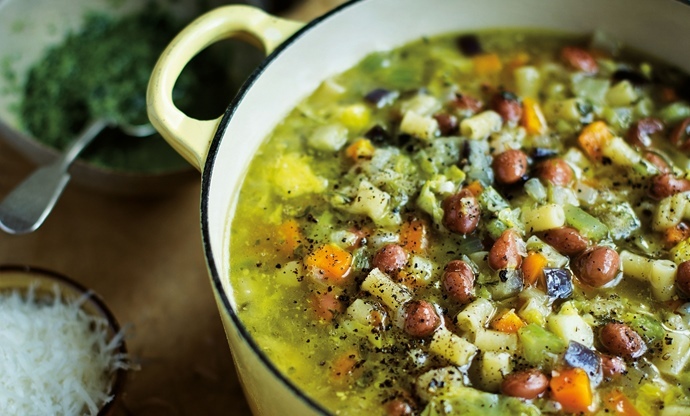 This is the Puglian twist on bean and vegetable soup. 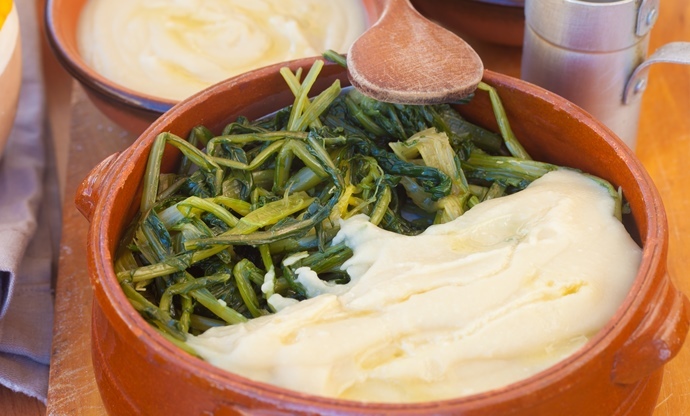 The traditional recipe pairs sweet and creamy fava beans (the dry ones, soaked in water and cooked in a clay pot or vase until they can be easily mashed into a purée) with pungent, bitter wild chicory. The beans form the base of the thick soup, while the chicory is sautéed with (local) extra virgin olive oil, garlic and chilli before being placed on top. 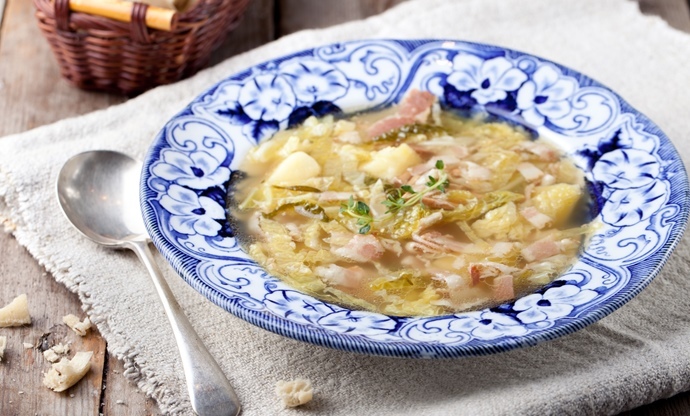 Cooked across Campania during winter, this rich soup takes its name – literally meaning ‘married soup’ – from the fact that the marriage of meat and vegetables result in a delicious dish. Wild herbs and winter greens foraged along the fields are essential ingredients: savoy cabbage, borage, young wild endive, chicory, torzelle (a sort of local kale) and others are quickly boiled and then plunged into a rich skimmed broth made with beef, chicken and/or pork – particularly the rind, fat sausages or ribs – according to different local variants. Once they’re cooked, small pieces of mixed meat are added to the soup and quickly cooked to blend the flavours. According to the specific area, the minestra maritata is served with a generous amount of grated mature cheese or with a local sort of pizza or flatbread made of cornmeal and water, called pizza ionna.